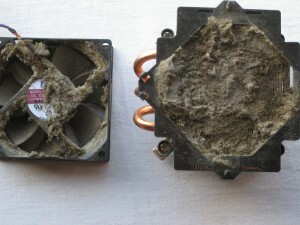 Home › Computer Stuff › Dangers of smoking! I had a call recently from a local lady whose ‘mouse had stopped working’. I popped in and had a look at the machine, and it was obviously not well. The mouse just did not work, the network connection was flaky, the main fan was roaring away at full speed permanently, and there was obviously a virus or viruses on the machine. With a 14 year old boy in the family who is into games, over clocking etc, there was always going to be some issues with this machine. Back in the workshop, luckily my PS2 mouse worked fine on it, but there was no way I could get a USB optical mouse to work, as all the drivers had disappeared out of windows . So I did my usual tasks, cleaned off the obvious junk programs, such as Bit Torrent, various search bars, speed enhancers etc, then installed and ran a good anti virus and a good spyware remover. All this time the fan was roaring away! Checked out all the BIOS settings etc, and every thing seemed to be normal, except that the CPU temperature was 55 degrees despite the fan going full speed. After some struggles I got the case open (why are all my jobs on computers with strange cases? 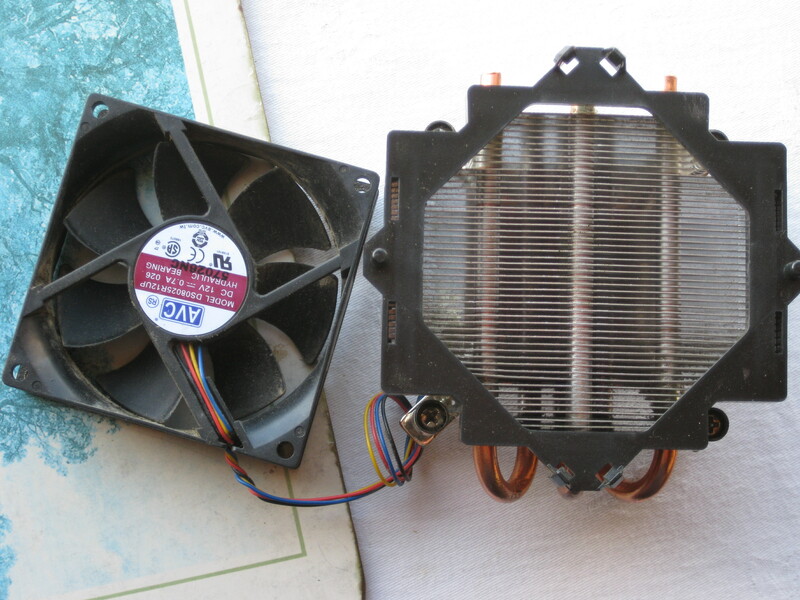 ), and took the heat sink and the fan off the chip, and separated them. What I saw was a little horrible. The photo below shows the dust inside the assembly, but this was no ordinary dust! It’s brown colour, and the smell that went with it told me that this dust was made up a fairly large amount of cigarette tar! There was an ashtray and a ciggy rolling machine next to the PC when I removed it, confirming the source of the rather oily, sticky ‘dust’. This layer of dust was totally impervious to air, so when the chip heated up, and the fan switched on, it was having absolutely no effect, hence the permanent full speed. A quick clean into the lovely condition shown below, and reassembly, saw the fan slow down to a very gentle purr, as it was designed to. After allowing all outstanding windows updates to download and install, next time I tried to re-install the drivers for the USB mouse, they had reappeared on the system, ready to be re-installed successfully. A quick run of a system optimiser, clean up the startup programs, remove the antivirus, antispyware and optimiser software, and make sure the clients antivirus was set up OK and it was returned to a very happy customer, with a computer health warning of the dangers of smoking!